The Unseen Library – Expert reviews of the latest and the best in Fantasy, Historical Fiction, Science Fiction and Crime Fiction from an Australian reviewer. For this week’s Waiting on Wednesday, I check out the new upcoming book from one of the fastest rising stars in fantasy fiction, RJ Barker. Barker shot to prominence in 2017 with his debut novel, Age of Assassins, which was quite an impressive piece of fantasy fiction. Age of Assassins was the first book in The Wounded Kingdom trilogy, and the rest of the trilogy, made up of Blood of Assassins and King of Assassins, were released to high critical acclaim in quite a remarkably short time period. With The Wounded Kingdom trilogy finished, Barker has moved on to a brand new series with The Bone Ships, the first book in his planned The Tide Child series, which is set to be released in September 2019. I really enjoyed Barker’s The Wounded Kingdom trilogy, with Age of Assassins and Blood of Assassins being among the top fantasy books I read in 2017 and 2018 respectfully. I still have to read King of Assassins, even after featuring it on my Books I Wish I Read in 2018 Top Ten list. Despite not getting around to reading it yet, King of Assassins is still quite high up on my must-read list, especially as I have heard that it is the strongest book in this inventive and exciting trilogy. I hope that I will get a chance to read it in the next few months, and I would like to read it before I look at Barker’s upcoming book. A number of details about The Bone Ships have already been released. The book’s amazing cover has been out for some time, and plot details about the book are available on Goodreads. The above summary sounds like The Bone Ships is going to be a lot of fun, as Barker goes from a trilogy about assassins to a book that focuses on a suicide squad of pirates as they attempt to kill a dragon. I mean, that is just plain awesome: pirates fighting dragons! Even if I weren’t already familiar with Barker’s ability as a fantasy author, I would already be trying to get a copy of this book. With Baker at the helm of this epic-sounding story, I have no doubts that this book will an absolute joy to read, and I am really looking forward to it. The Bone Ships has real potential to be one of the best fantasy books of 2019, and no doubt it will be one of the most sought-after releases this September. I am quite excited for this latest novel from Barker, and I am sure it will prove to be an interesting book to review. Top Ten Tuesday is a weekly meme that currently resides at The Artsy Reader Girl and features bloggers sharing lists on various book topics. For this week’s Top Ten Tuesday, bloggers get to talk about the first ten books that they ever did a review for. This is quite an interesting topic for a top ten list, and it is one that proved to be a lot of fun for me to put together. It is always an intriguing prospect to dig back into one’s past, and I was quite curious to see what my earliest reviews were. Luckily, I have kept a copy of some of my earlier professional reviews for The Canberra Times, which were among the first reviews I ever did. Thinking back even further, I also remember doing a bunch of reviews or review-like documents for a random assortment of books back in my school days. I decided to include them, as I count them as books I have reviewed, especially as many of them required a large amount of work to do. As a result, my list is going to be an interesting combination of historical fiction books and some of the novels I read in high school, which luckily proved to be quite a unique and diverse collection of tomes. I reviewed The Other Side of Dawn when I was in year 8 for an English class I was doing. I cannot quite remember why we had to do reviews, but I remember inadvertently spoiling parts of the story for someone who hadn’t read it (an important lesson I remember to this day). The Other Side of Dawn is the seventh and final book in John Marsden’s Tomorrow series, which is one of the best and most iconic Australian young adult series of all time. I was a huge fan of the Tomorrow series when I was younger (I still am, to be honest; it is a pretty epic series) and I had just finished the final book when I had to write a review for class, so it seemed the logical choice. I cannot remember too many details about the review, but it got me a good mark, so it must have been alright. This is one of those series I have read numerous times, and I will have to review it on my blog at some point. I reviewed this classic American novel from acclaimed author Harper Lee in an English class in year 10. We were starting to learn a lot about analysis and essay writing at the time and To Kill a Mockingbird was a major focus of our class. I wrote a bunch of reviews and essays for this book, and I found it to be quite a powerful and moving novel that is still relevant in this day and age. In the latter half of 2007 I was still in school, and we got a choice of which English classes we wanted to attend. Due to my love of the genre, I chose to do a fantasy fiction course, which was unfortunately taught by the very worst English teacher in our school, whose bad teaching still haunts me to this day. While the class as a whole was pretty shocking, we did get to read and review Daughter of the Empire. I was already a huge fan of Raymond E. Feist and his Riftwar series, so this was the perfect book to read in class. We did a number of reviews and essays for this book, and I loved it so much I have re-read Daughter of the Empire and its sequels several times in the last 12 years, even doing a review of the Empire trilogy on my blog last year. The same fantasy course also required us to read and give an in-depth presentation on a fantasy book of our choice. I chose one of my favourite books in Terry Pratchett’s Discworld series, The Last Continent. The Last Continent is the 22nd book in the Discworld series, and follows one of Pratchett’s most entertaining protagonists as he adventures around a continent on the Discworld that is definitely not Australia. I gave quite a good presentation on this book, if I do say so myself, and it was a great book to round out the class on. A review of The Last Continent will probably show up on this blog in the future, as it is quite a funny read. Another book reviewed as part of an English class. Postmortem was the book we had to read and review as our main assessment in a pretty good crime fiction course. It was an interesting book to analyse, and we did a pretty detailed examination and discussion of the book throughout the length of the course. I have never really gone out of my way to read any other Cornwell books, but I am glad we got the chance to review Postmortem, and it was quite an intriguing piece of crime fiction. Back in 2009, while I was in my first year of university, I got an opportunity to review some books for The Canberra Times. They were in need of someone to review historical fiction, and as that was the genre I was mostly reading at the time, I managed to secure a position as The Canberra Times’s historical fiction reviewer for a few years. For my first review, they gave me a couple of books publishers had sent them and told me to have a go at writing an article. The first book I read for this was Outlaw, the first book in Angus Donald’s The Outlaw Chronicle series. I really enjoyed this book and thought that it was a great reimagining of the classic Robin Hood story, and it proved to be an excellent book to do a proper, professional review for. Despite enjoying this book, I never got the chance to read any of the other books in The Outlaw Chronicles, which I see managed eight books in the end. I might have to see what Donald has been writing lately. In addition to Outlaw, my first article in The Canberra Times also featured a review of Pieces of Eight by John Drake. Pieces of Eight was another reimagining of a classic tale, as Drake created his own version of Treasure Island in this series. Pieces of Eight is the sequel to Drake’s first book, Flint and Silver, and featured a compelling adventure on the high seas. This was another great book to read, and I had a lot of fun reviewing Pieces of Eight. This was the second book in Sidebottom’s Warrior of Rome series, which continued the story started in his amazing debut, Fire in the East. Sidebottom is one of the top authors of Roman historical fiction, and back in 2009 I was very excited to check King of Kings out after enjoying his first book so much. This was another great historical adventure, with an epic twist at the end. Sidebottom is still going quite strong; The Last Hour was released last year, and his latest book, The Lost Ten, has just come out. Raiders from the North is the first book in Rutherford’s Empire of the Moghul series, which charted the rise and fall of one of history’s most powerful and self-destructive dynasties. This was a very good book that looked at a very unique period of history that is quite under-represented in fiction. I ended up reading and reviewing nearly every book in the Empire of the Moghul series over the next couple of years, and I really enjoyed this very intriguing series. This is a good place to end my list. I am a huge fan of the Scarrow’s The Eagles of the Empire series, and it was one of the main historical fiction series that got me into the genre. As a result, I was very happy that I got a chance to review the ninth book in The Eagles of the Empire series, The Gladiator, so early in my reviewing career. The Gladiator is an excellent addition to the series which pitted its protagonist against a new type of opponent. This series is still going strong, with its 17th book coming, The Blood of Rome, coming out last year. I hope you enjoy my list; I had a good time putting it together. I will have to try and scan a few of these earlier columns onto my blog in the future. It was fun going back and seeing what some of my earliest reviews were. Ok, now this was one hell of a book!!! K. J. Parker’s Sixteen Ways to Defend a Walled City is an exceptional piece of fantasy fiction that keeps the reader enthralled with its excellent story, fantastic self-aware humour and one of the best depictions of a siege that I have ever had the pleasure of reading. The end result was an excellent read that I just had to give a full five stars to, and it has to be one of my favourite books of 2019 so far. The Robur Empire is one of the great civilisations in the world, and at its heart lies the City, capital and seat of power of the Emperor, kept safe by its impenetrable walls, powerful armies and unsurpassed navies. However, that safety is unexpectantly compromised when a massive force of soldiers appears out of nowhere, slaughtering the entire imperial army, crippling the navy and completely surrounded the City. The only forces left garrisoned in the City are the men of the Empire’s Engineering Corps, led by Colonel-in-Chief Orhan, who suddenly finds himself in charge of the defence of the City. Orhan is a coward, a glorified bridge builder, a man able to work the complex imperial military system for his own gain and a foreigner despised by most of Robur society, but he is not a great military leader. He is, however, one of the most devious and underhanded men the army has ever seen, and these might just be the qualities needed to save the City from destruction. As Orhan works to unite the various factions in the City to his cause and come up with a range of unique defences, he makes a shocking discovery. A figure from his past is leading the assault against the City, and Orhan quickly realises that he might be on the wrong side of this battle. I really enjoyed this latest book from Parker, who has created a complex and captivating fantasy tale that proves exceedingly hard to put down. K. J. Parker is actually a pseudonym of author Tom Holt, who was able to keep the dual identity secret for 17 years before it was revealed in 2015. Between his two identities, the author has written an amazing number of books since his 1987 debut, mostly focused on the fantasy genre. 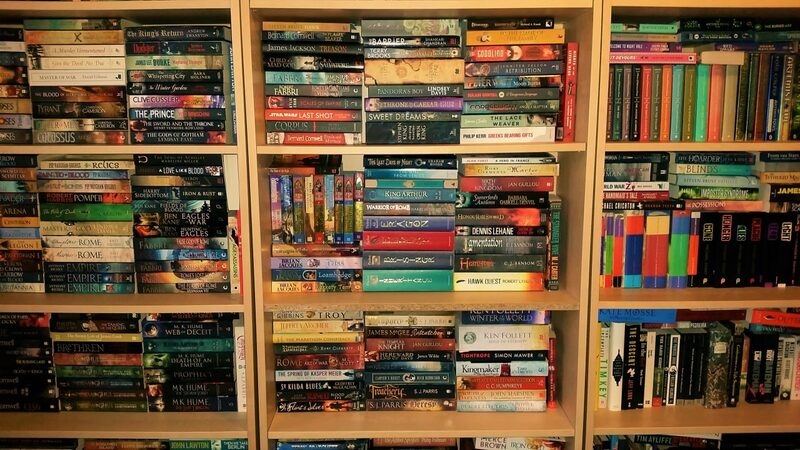 This includes over 30 humorous fantasy novels as Tom Holt, five historical fiction novels, the Fencer, Scavenger and Engineer trilogies as Parker, a number of standalone fantasy books and a huge range of short fiction, some poems, songs and even some non-fiction work. For those who may be concerned, no reading of any of Parker’s prior work is required to enjoy Sixteen Ways to Defend a Walled City as this latest book is a standalone novel. Still, I will be keeping an eye out for any future books by either Tom Holt or K. J. Parker as I really enjoyed the author’s writing style and fantastic sense of humour. Sixteen Ways to Defend a Walled City is an intriguing novel that is told from the perspective of its “hero” Orhan, who is narrating the story of his defence of this city within a historical text. This story is incredibly entertaining, as not only does it feature a first-rate siege within an excellent fantasy location, but it is told by a complex and multi-layered character who paints the entire ordeal of being in charge in a very funny light. I am a man who loves a good siege storyline, but this has to be one of the best ones that I have ever had the pleasure of reading. At the start of the siege the situation looks grim, as a vast host surrounds the City, whose defenders have all been slaughtered outside the walls, with the exception of Orhan’s engineers, who lack the basic military supplies and machinery to defend the City. As the enemy start a conventional long-term siege with advanced weaponry and superior forces, Orhan is forced to come up with something to delay their inevitable defeat in the hopes of reinforcements turning up. Without the required men, equipment or leadership, they cannot rely on the traditional 15 methods of defending a walled city that the books suggest, so he has to rely on the on his own 16th way, which involves bluffing, chaos and mad-cap innovation. As a result, much of the book features Orhan’s many unconventional methods to defend the City, whether it involves taking symbolic control of the entire empire, legitimising and attempting to control two rival criminal gangs or creating devastating new siege weapons. The protagonist and his men’s engineering prowess comes in effect quite a bit throughout the book, and I loved seeing the machines and other unique defence methods that he deploys as a result. All the various deceptions and tactics used to hold the City against this superior force is widely entertaining and I absolutely loved the siege storyline which serves as an amazing centre to this incredible story. The setting that the author chooses for this book is pretty interesting and adds a lot of great elements to the story. The Robur Empire is pretty much the Roman Empire, with the City being this universe’s equivalent of Rome. I thought that the City was a fantastic setting for the vast majority of the story, and the various factions and problems with such a large city really tied into the great siege storyline. The City’s criminal organisations, the Greens and the Blues, former charioteer supporters (very Roman) turned rival criminal unions, are the cause of a large amount of strife, and I liked how their own battles and self-importance became such a major part of this book. I also felt that Parker did an amazing job portraying a city that sits at the heart of a massive empire, and the attitudes of the people within felt pretty accurate. On top of the great setting, Parker has also created an intriguing, extended world for this story. The Robur Empire is a great overall setting for most of this book, as its setup, design and attitudes are very similar to the ancient Romans. Parker’s initially subtle use of racial identity in this empire is quite intriguing, and it becomes a major part of the book. Essentially the empire is made up of the pure-blooded Robur, who are called blueskins due to their darker skin colouration. Then there are those people with white skin, who are given the derogatory name of milkfaces, who are treated like second-class citizens within the empire, and who came from lands conquered by the Imperials. Not only does this become an important plot point with the army attacking the City made up completely of milkfaces, but it is reminiscent of the Roman Empire, when the pure-blooded Roman citizens looked down upon the paler barbarians from Gaul, Britain or Germany. I also liked how the author tried to replicate the precision military system of the Romans with the Robur, and it was fun to see how the problems of such a system came into play throughout this book, such as having the military resources of the entire empire being kept in supply depo sites rather than in the capital. I quite enjoyed these fantastic settings, and I thought that they were an excellent place to set these complex stories. While the siege storylines and settings are extremely amazing, this book would be nothing without its main character and the person narrating this fictional historical text, Orhan. Orhan is an amazingly complex character, and the personality that Parker creates for his hero is outstanding. Orhan is a milkface who has risen to high military command within the Robur Empire due to his abilities as an engineer. As a result of his hard early life and the constant belittlement and discrimination by the blueskins he serves under, he is an incredibly cynical person with a very jaded outlook on life. The author does an amazing job transcribing these character traits onto the page, often in a sarcastic and very entertaining manner as he describes the events going on around him, and the reader gets a great sense of the character’s frustrations. While Orhan is attempting to defend the City, his own narrations reveal him to be an extremely self-serving and selfish person who has been forced by circumstances rather than duty to protect the City. His motivations become even more complex as he begins to wonder if he is on the wrong side of the conflict, as the invading army is completely made up of milkfaces like himself, and even when he is doing the right thing the blueskins in the city that he is defending still treat him badly. Even with that doubt, he is a surprisingly (especially to himself) effective commander, whose deceitful and inventive nature, as well as his extensive knowledge of history and engineering, allows him to come up with some outstanding defensive strategies. My favourite has to involve his unique method for dealing with the enemy’s sappers, which sees him use his knowledge of the City, his craft and his ability to manipulate his opponents to create a fantastic response. The entire sequence involving this anti-sapper technique is one of the best parts of the book, and I love the doubt and regret he experiences as a result of his actions. Overall, Orhan is an outstanding narrator, and his depiction of the chaotic event and his part in them really made this story for me. Sixteen Ways to Defend a Walled City is an exceptional piece of fantasy fiction, and I think I already have a contender for my future top ten books of 2019 list. This book has to be read to fully appreciate its complexity and cleverness, and I found it to be boundlessly entertaining and widely funny. K. J. Parker’s latest book comes highly recommended, and it is well worth checking out.